With the very recent election of Bill Shorten as Opposition Labor Leader much has been made of the lack of political membership in the Australian Labor Party. Party membership across all the parties is in sharp decline. On that point, I was unable to find any actual detail on the Liberal Party, with the exception of Our Structure which states 80,000 in the Organisational Wing. Instead of using the website figures I’ve chosen to go with the wider held view that the LP has only about 50,000 paid members given that in 2008 there were just 13,000 members in Victoria. The best data I could get on the Greens was from a 2010 Age article which had them above 10,000 for the first time in their political history. To emphasise just how poor the health of political party membership is I thought to put together an infographic on how they stack up against other organisations as originally suggested by Cathy Alexander in her recent Crikey piece plus some additional groups that I have thrown in. The Melbourne Cricket Club waiting list. 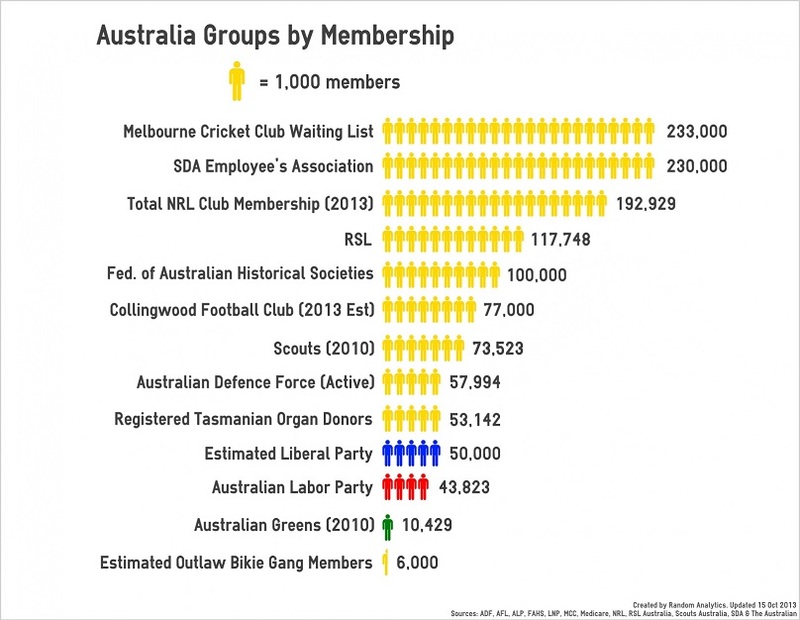 Luckily for both the Liberal and Labor party’s they still outnumber criminal bikie gang numbers. Alas, these insignificant political sectarians do still have territorial power over us and do not allow us do secede from them and do our own things. The rule of any political party should be confined to its voluntary members and subscribers. They none of them could any longer harm or wrong the rest of the population of a country. If they would be able to set an attractive example, then they would get more and more members and subscribers. Why should their “business” be different from any other free enterprise business or enterprise? Why should not all people have consumer sovereignty towards them. Why should they and their system, ideology or program not be subject to free enterprise competition? Only once this is achieved can we expect any progress from any of them. Until then their territorial party and power politics leads us from one crisis to another. Tolerance for tolerant activities works well in all other spheres. It would also work well in this one. E.g. inflation and mass unemployment could be ended fast in this way. Even war could be ended thereby. Why fight when you are free to do your own things, together with like-minded people – everywhere on earth, on a private property, free enterprise basis for all, including all cooperative, self-help and self-management options, in all their vast varieties? Every ideology, every utopia could be freely tried – but always only at the expense and risk of their present believers. – John Zube, john.zube@bigpond.com, 28.8.15.